Pan Gang, chairman of the Inner Mongolia Yili Industrial Group Co Ltd, part of a delegation of Chinese agricultural companies, in his speech at the business roundtable highlighted the importance and bright future of the agricultural cooperation between China and the US. He also gave a detailed introduction to the Sino-US Food Wisdom Valley project, which will encourage innovation and cooperation in the agricultural and food sectors. At the roundtable, there was a consensus over the establishment of the Sino-US Food Wisdom Valley, which would be led by the Yili Group during the implementation process. Before the roundtable, Xi greeted the business leaders, including Pan, and acknowledged the work Yili has done. The roundtable was among the most important events during Xi's visit and was jointly hosted by Jiang Zengwei, president of the China Council for the Promotion of International Trade, and Henry Paulson, former secretary of the US Treasury. Pan, together with Jack Ma of Alibaba Group Holding, Pony Ma of Tencent Holding Ltd and Yang Yuanqing of Lenovo Group, attended the roundtable. Pan was seen closely interacting with Warren Buffett, Apple CEO Tim Cook and PepsiCo CEO Indra Nooyi prior to the beginning of the roundtable. During his speech, Pan said cooperation in the agricultural sector between the US and China is very important as the two sectors can be complementary to each other. The Chinese and US leaders set eight key areas for agricultural cooperation and the major principal for cooperation, which is to complement each other's strengths. "Chinese agricultural firms look to further the cooperation with universities, enterprises and research institutes, and to better serve Chinese consumers," he said. With more and more regions in China generating GDP of more than $10,000 per capita, Pan said there will be more market opportunities for diversified, personalized and healthy products. That will also provide room for innovation and cooperation in the agricultural and food sectors of both countries. Yili's brands, which include Satine, Ambrosial, Pro-kido, Yili Chang Qing and Chocliz, are good evidence of that innovation, he said. The Sino-US Food Wisdom Valley project was established within that context of cooperation and innovation. Yili will ensure the program is fully implemented and assume the responsibilities as the leading enterprise in the industry, Pan said. Pan said Yili has gathered some of the world's top universities - including those with the best agriculture, management and life science programs - and research institutes to work on the program. The universities and research institutes will work together in nutrition and health, product development, food safety, agricultural technology, animal husbandry and veterinary medicine, ecology and environmental protection, enterprise management and talent development. It will be a talent pool that includes the best universities, academic institutes and researchers. "It will be a new engine of cooperation between the US and China and will set a new example as a research program in benefiting people from both countries," he said. The roundtable was followed by a launch ceremony for the Sino-US Food Wisdom Valley project. Jiang Zengwei, along with 100 honored guests from both China and the US, including delegates from the University of Pennsylvania, Cornell University, Yale University, University of Toronto, University of California, Davis, the Wharton School of Business and the University of Minnesota, witnessed the inauguration of the program. There were also a number of trademark programs that were signed at the ceremony. 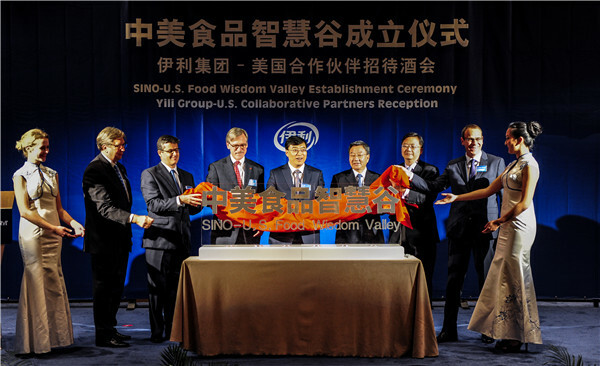 The launch of the Sino-US Food Wisdom Valley is one of the more important business cooperation pacts signed during President Xi Jinping's visit to the US. The leading company in China's dairy industry, Yili has been an important participant in China-US agricultural cooperation and has benefited from the deepening cooperation, said Jiang. "The Sino-US Food Wisdom Valley project displays the international strategy and the foresight vision of the Yili Group. I hope the program will expand with time and become an important milestone in the two countries' agricultural cooperation," he said. Based in North China's Inner Mongolia autonomous region, Yili is the biggest dairy producer in Asia, with businesses reaching out to Europe, the Americas and Oceania. The Shanghai-listed company reported 30 percent net profit growth in 2014 after earning a combined net profit of 4.17 billion yuan ($655 million), according to its 2014 annual report released in April. The company's sales revenue increased 13.9 percent to 54.4 billion yuan in 2014 from the previous year. According to the China General Chamber of Commerce-USA, last year the company beat other domestic companies to rank first in five areas, which include milk powder, ice cream and liquid milk.